It gives me great pleasure to introduce this important and fascinating book on the internal dilemmas youngsters face in school, which often cause them to stop learning. We are all too ready to ascribe learning problems to an inability to learn and leave it at that. This book should go a long way toward convincing us that using such simpleminded explanations and remedial efforts based on them do not work. 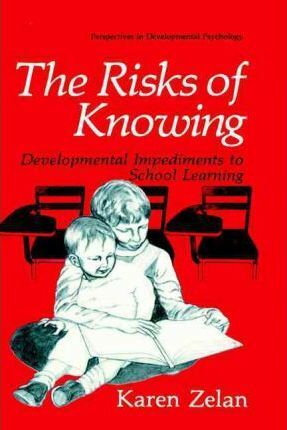 Unlike other books that identify the causes of learning disabilities in children or that detail society's impact on the so-called helpless child, The Risks of Knowing is an in-depth study of young people who for reasons of intrapsychic conflicts and of intellectual development make a nega- tive decision about the learning process. This book is unique in its thorough analysis of the conflicts young people have with learning and in its treatment prescriptions. In case after case, Karen Zelan demonstrates that if young people declare themselves unable to learn it is because for some valid reasons they believe learning is dangerous. The reasons that cause a decision to fail often remain unconscious until they are brought to the child's awareness. When the child is helped to understand the source of any inner dilemmas, both child and parents are able to find better solutions to immediate learning difficulties. Karen Zelan brings a rare expertise to the problems young people find in academic learning. Illustrations note IV, 329 p.
1. An Introduction to the Young Person's View of Learning.- 2. Perceptions and Realities.- 3. The Importance of Conceptual Development.- 4. Ambivalence about Knowing: Timothy and Annie.- 5. Overachieving and Underachieving: Two Misunderstood Children.- 6. Cognition and Communication.- 7. Cognition and Escape: School Phobia.- 8. Cognition and Inhibition.- 9. Cognition and Overcoming Inhibition.- 10. The Determination to Learn.- Appendixes.- Appendix A. Mean IQ Score by Grade among Children Tested.- Appendix B. Screening Tests.- Appendix C. Number of Screening Tests by Grade among Children Tested.- Appendix D. Piagetian Interview Tasks.- Appendix E. Follow-Up Data.- References.- About the Author.